Groffdale Barns is committed to providing you with quality shed row barns & stables, custom-built to your specifications. 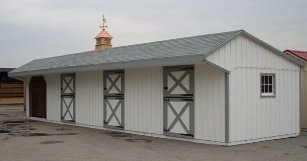 Each of our Shed Row barns are pre-constructed at Groffdale Barns and then delivered and installed at your location. From the Oak frames and Kickboards to the Spruce Rafters and Powder-Coated Hardware, we build each detail with superior quality and class. 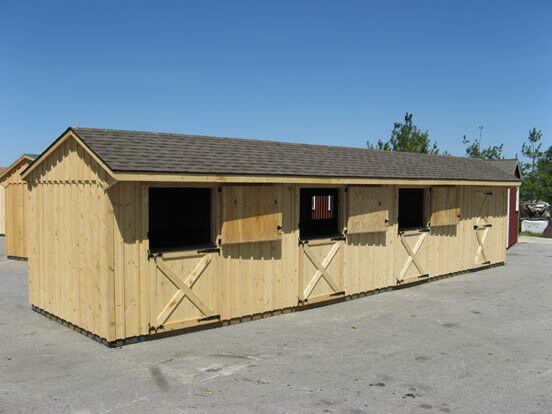 Shed Row Barns are available with 8', 10', or 12' Lean-to. I just wanted to drop you guys a note to tell everyone how awesome our barn is! We bought a house in New York State, and I did a lot of research before finally deciding on a company to go with. Once our barn was brought home, it didn’t take my boys long to settle in! I bought a 3 stall barn with a really nice tack room. They both love their super deluxe sized stalls so much that I have a hard time getting them out and into their paddock!